St. Jude Thaddeus is the patron of hopeless causes. We turn to St. Jude in times of need and for serious or seemingly hopeless causes — including depression, grieving, unemployment, and illness — and ask for his divine intercession. 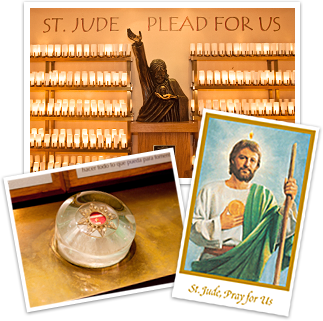 As difficult situations arise in your life you can always send your prayers and petitions to the altar of St. Jude at the National Shrine of St. Jude. St. Jude is traditionally depicted carrying the image of Jesus in his hand. This represents the imprint of the divine Countenance that was entrusted to him by Jesus. We are confident that our invocation of our most powerful patron, St. Jude, lifts our petitions to the God who always loves us.